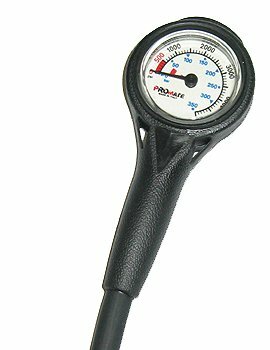 This is a compact air pressure gauge is great for accurate readings up to 5,000 psi. Features include: Made in Italy Compact design 5000 psi service Quality brass housing and copper beryllium bourdon tube for the most accurate pressure measurement available 32" hose with standard 7/16" fitting Luminescent dial face for easy viewing in low light situations Model #MG010 AUTHORIZED DEALER FULL MANUFACTURER´S WARRANTY!!! Be safe on your next dive without breaking the bank. Get this great air pressure gauge. AUTHORIZED DEALER FULL MANUFACTURER´S WARRANTY!!! If you have any questions about this product by House of Scuba, contact us by completing and submitting the form below. If you are looking for a specif part number, please include it with your message.